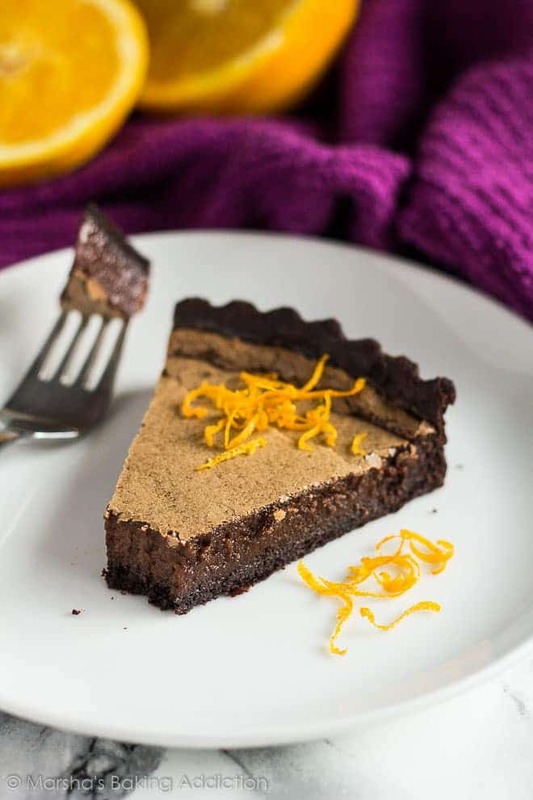 Dark Chocolate Orange Tart – A buttery, flaky chocolate orange-infused crust filled with a luxuriously creamy chocolate orange pudding! 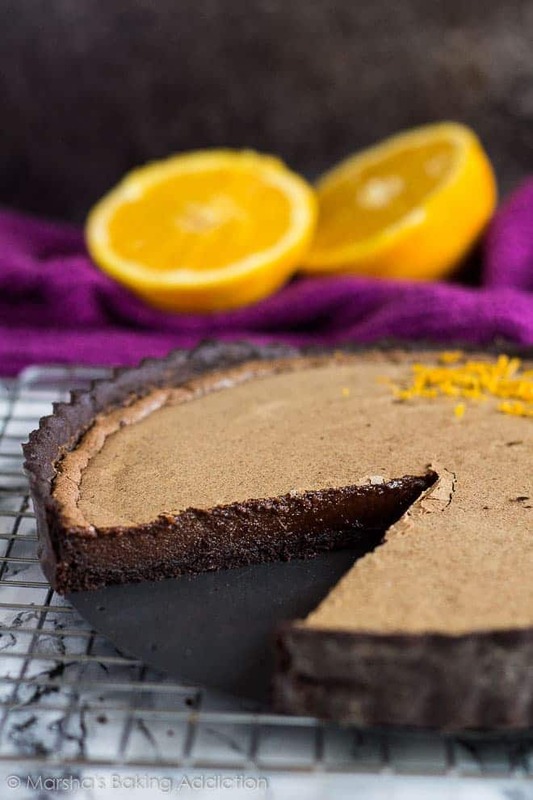 Today, I bring you another recipe that combines two of my favourite flavours – chocolate and orange. 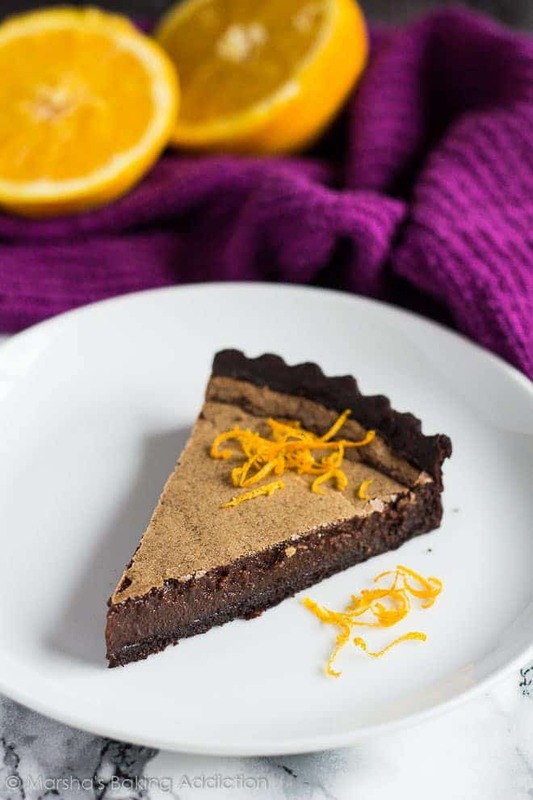 I bring you my Dark Chocolate Orange Tart! 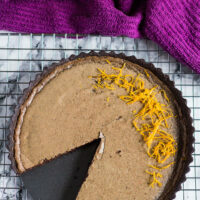 This tart is luxuriously rich and creamy, it is just divine. 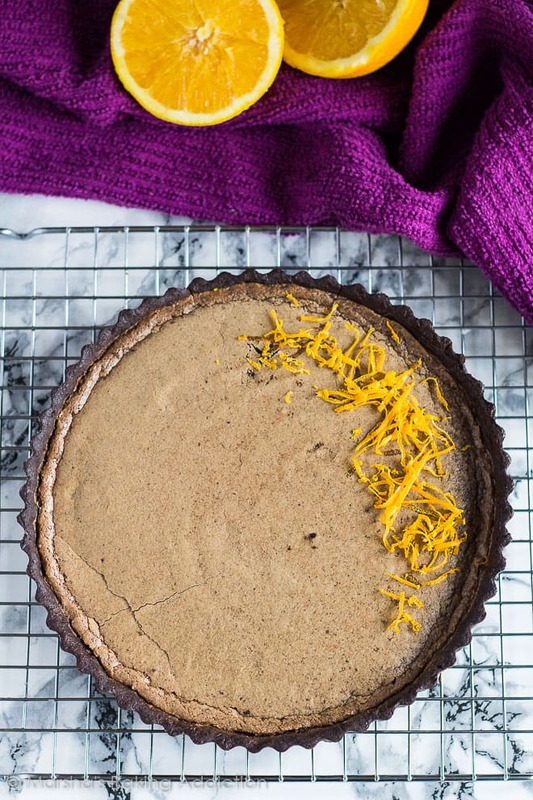 The crust is definitely a favourite part of this tart for me. It’s deliciously flaky and buttery (see those specks of butter? Yum! ), wonderfully chocolatey, and infused with orange (zest and juice). Your kitchen will smell amazing just making the crust! 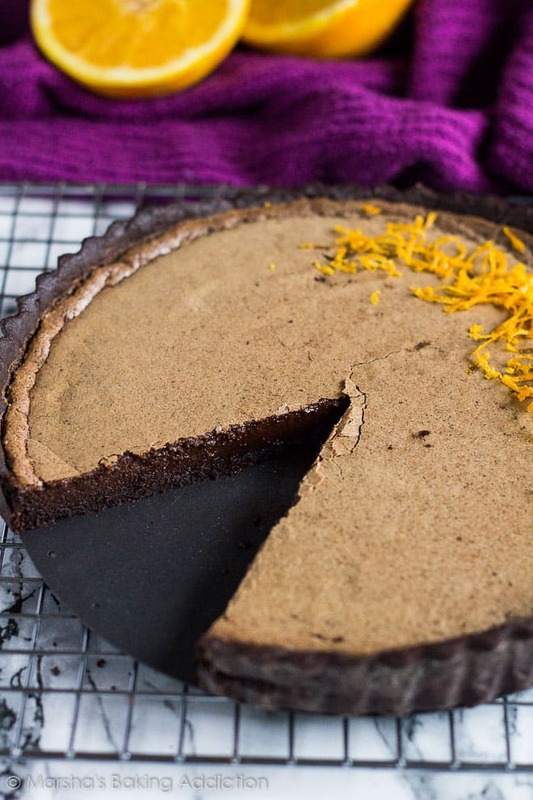 The chocolate orange crust is blind-baked before adding the filling. All you need is some foil or parchment paper, and some baking beans. Line the pastry-lined tin with foil, then fill with the baking beans. Bake for 15 minutes, then remove the foil and beans and bake for a further 5 minutes. Brush with beaten egg, and bake again for 1 minute. And you’re done! Be sure to keep the dough cold at all times. This helps achieve a flaky crust, and helps prevent shrinkage during baking. I like to chill the dough for an hour before lining the tart tin, and then another hour after lining the tin. Now, for the filling. The filling only contains 5 ingredients – dark chocolate, cream, sugar, eggs, and orange juice. Simply melt the chocolate, then combine all the ingredients together. 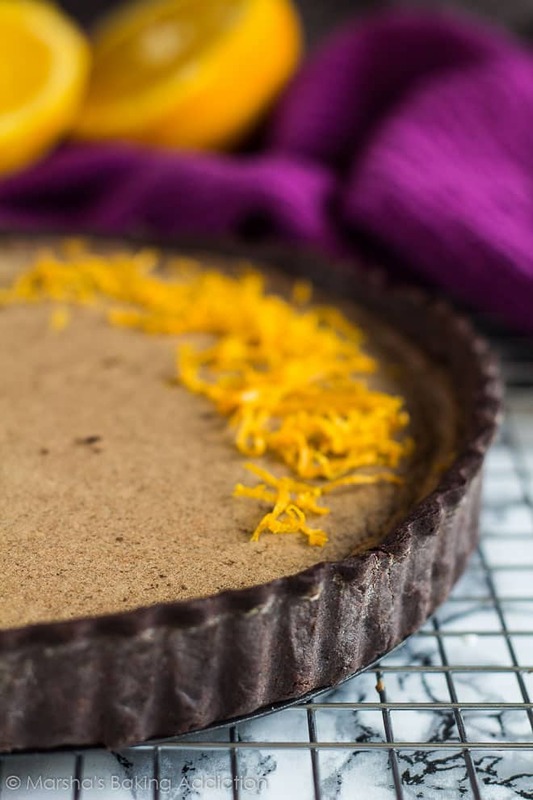 Pour the filling into the baked tart crust, and bake for 25 – 30 minutes until the top is set and the centre is no longer wobbly. The chocolate orange filling is seriously melt-in-your-mouth goodness. 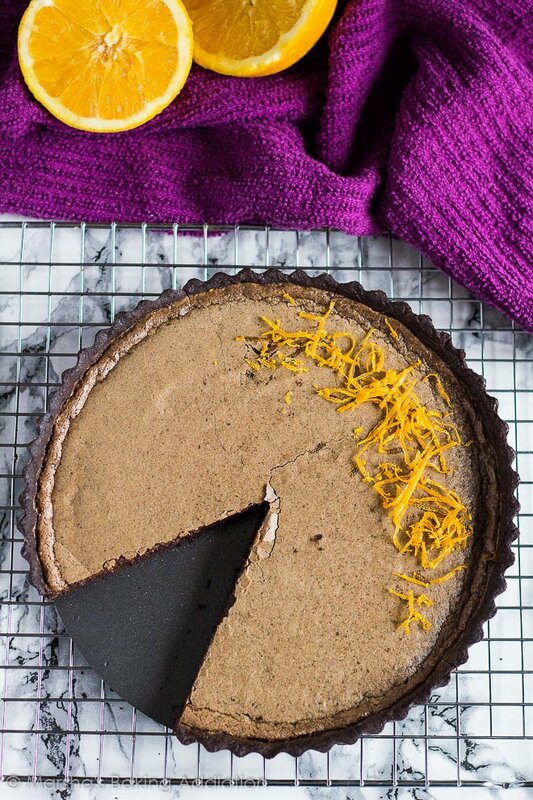 It’s incredibly creamy and velvety, making this tart a chocolate lover’s dream dessert. 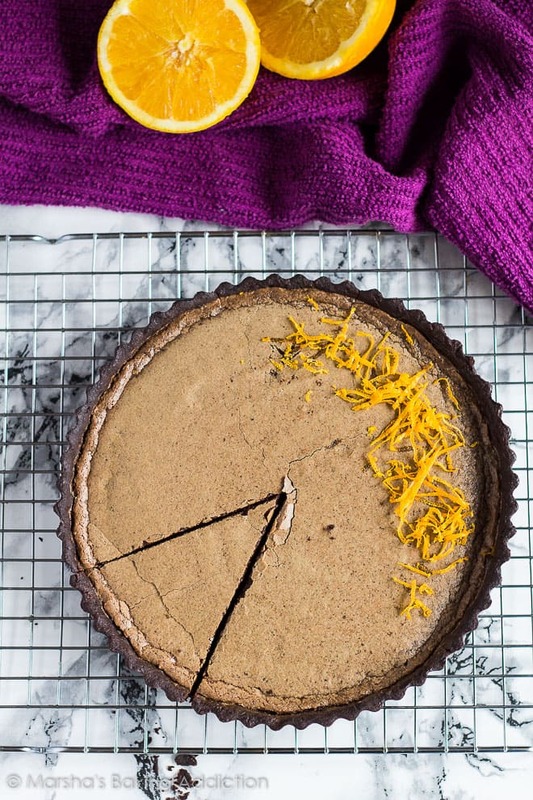 Trust me, you’re going to LOVE this tart! Make these delicious tarts next! 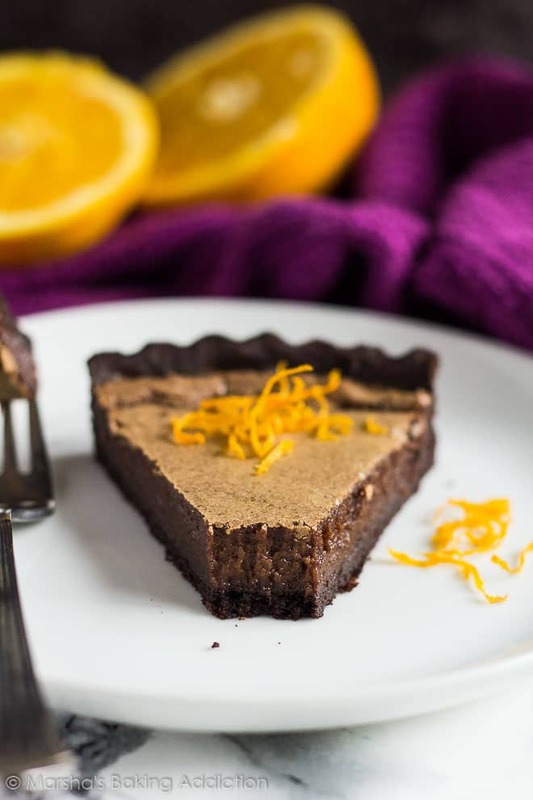 A buttery, flaky chocolate orange-infused crust filled with a luxuriously creamy chocolate orange pudding! In a small bowl or jug, whisk together the egg yolk, water, and orange juice. In a large bowl, mix together the flour, zest, cocoa powder, sugar, and salt. Add the butter, and using a pastry cutter, or two forks, cut the butter into the flour mixture until it resembles coarse meal with pea-sized pieces. Add the egg mixture, and stir with a rubber spatula or wooden spoon until the dough starts to come together. Transfer the dough to a floured surface, and gather into a ball. 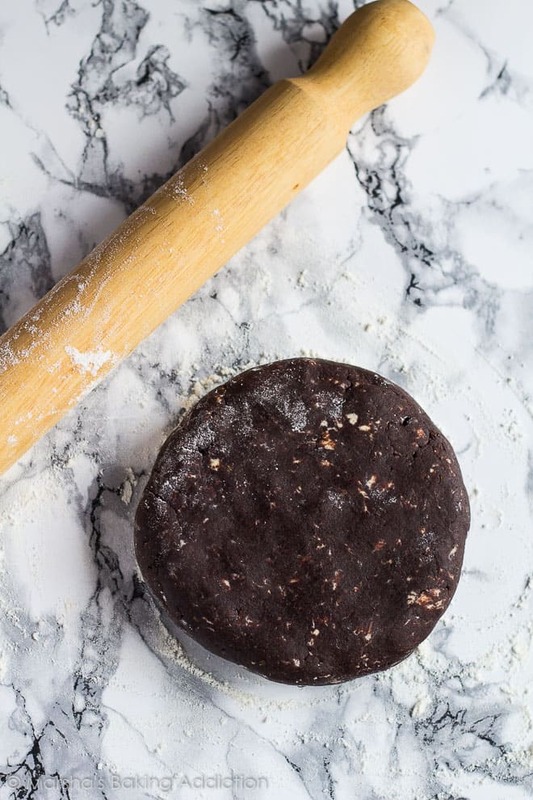 Shape the dough into a 1-inch thick disc. Wrap tightly in clingfilm, and refrigerate for at least an hour (and up to 5 days). You can also freeze for up to 1 month. Thaw overnight in the fridge before use. On a lightly floured surface, roll out the dough to line an un-greased 23cm/9-inch fluted tart tin with a loose base. Press lightly into the tin, making sure not to stretch the dough. Roll the pin over the top of the tin to cut off the excess dough. Prick the base all over with a fork. Place in the freezer for 30 minutes. Line the chilled pastry crust loosely with foil or parchment paper, and fill with baking beans. Bake for 15 minutes, then remove the beans and foil and bake for a further 4 minutes. Brush the base and sides of the crust with beaten egg, and place back into the oven for 1 last minute. Leave to cool on a wire rack. In a microwaveable bowl, melt the chocolate in 20 second intervals, stirring after each one. Leave to cool for 5 minutes. In a separate bowl, mix together the cream, sugar, eggs and orange juice until combined. Gradually stir in the chocolate, then pour the mixture into the pie crust. Bake for 25 - 30 minutes, or until the top is set and the centre is no longer wobbly. You can make this tart a day in advance. Simply make as instructed, cover tightly, and keep in the fridge overnight ready for the next day. Leftovers will keep fresh in the fridge for up to 3 days. This looks amazing, I love orange and chocolate. Can I use vegan butter, Marsha? 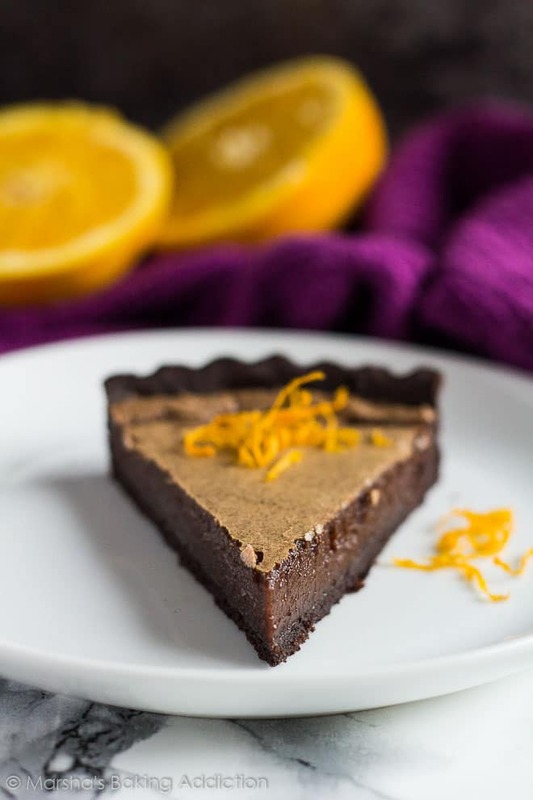 Chocolate and orange is such a great combination of flavors! 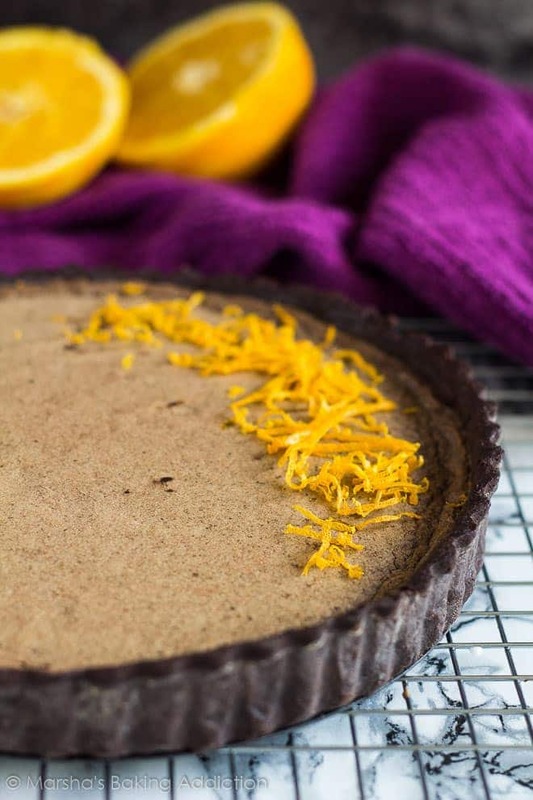 And the orange zest gives the tart a nice pop of color! It definitely is, I love chocolate and orange! I’m so glad you enjoyed it, Danah! 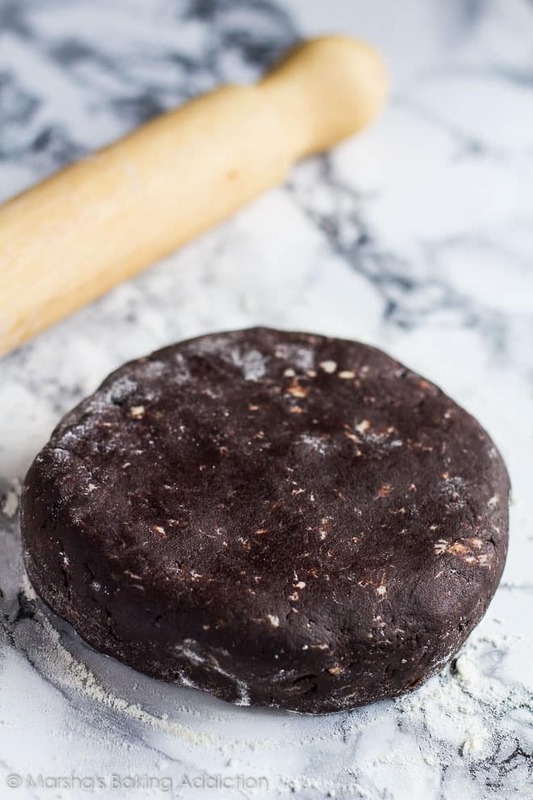 Can I use dark chocolate morsels? Or do I use dark chocolate baking bars ( 100% cacao) without sugar? Or neither?